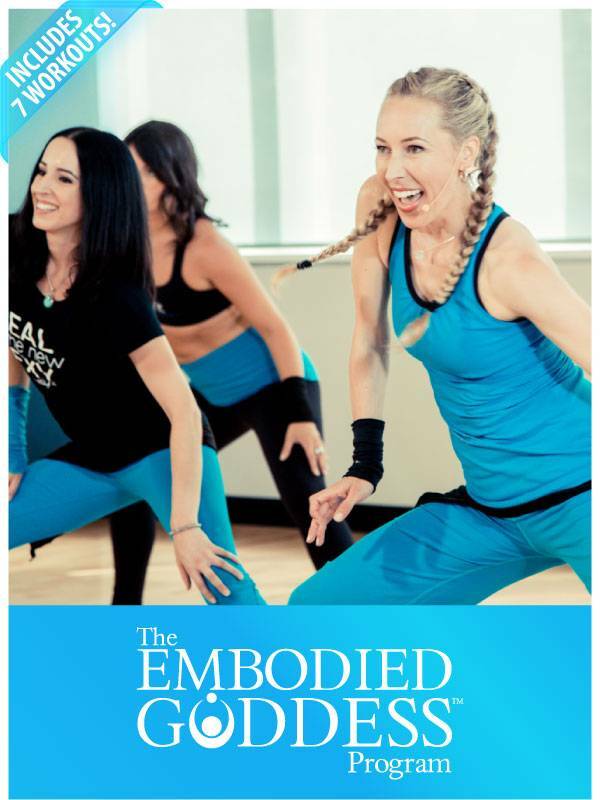 If you are looking for a very well rounded cardio, toning, meditation, stretching and mindfulness, the Embodied Goddess set by Bellyfit is the set for you. As always, each workout is suitable for all levels and is accompanied by an incredible soundtrack. This system allows you to exercise at home with any of their seven 45 minute Embodied Goddess videos that come in the set. This set is available as a digital download and is only $24.99! Keep reading to learn more & stay tuned on the blog for detailed reviews of all the Bellyfit Embodied Goddess workouts. Alice leads this 49 minute routine with 6 background exercises, showing various modifications, in a nice open studio. You wont need any equipment for this cardio, core, & meditation workout. After breath work, and a warm up you move into a cardio routine that is followed by a short core section, cool down stretch, & lotus mudra. Exercises include: hip shakes, hip circles, chest slide, side toe taps, shimmy, ham curls, chasse, low squat walk with rock the baby arms, side hip walk, stomp & balance challenge, balance tree pose alternating legs, squat & lunge, plie, fsat feet shuffle, standing rib carge circles, torso twists, shoulder pushes, and stretches. These routines are a refreshing blend of mind body & cardio making them super unique & a great addition to anyones workout library. Alice is a great lead with a fun vibe & excellent cuing & instruction. I received this workout to review.